Earlier this month we went with the kids to the Belladrum Festival near Beauly. It was my first music festival and despite the fact that I don't like crowds and I don't like noise I even managed to enjoy myself a little. Brilliant small festival for families though, I'd heartily recommend it. 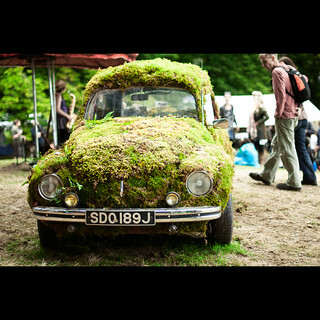 Found this moss covered car by artist Rosie Newman and thought it was pretty cool.